I’m in Shenyang, China, as part of the faculty for Northeastern University’s International Economics and Management program. My primary role is to talk about the economics of fiscal policy, explaining the impact of both taxes and spending. But regular readers already know my views on those issues, so let’s look instead at the vaunted Chinese Miracle. And I don’t use “vaunted” in a sarcastic sense. 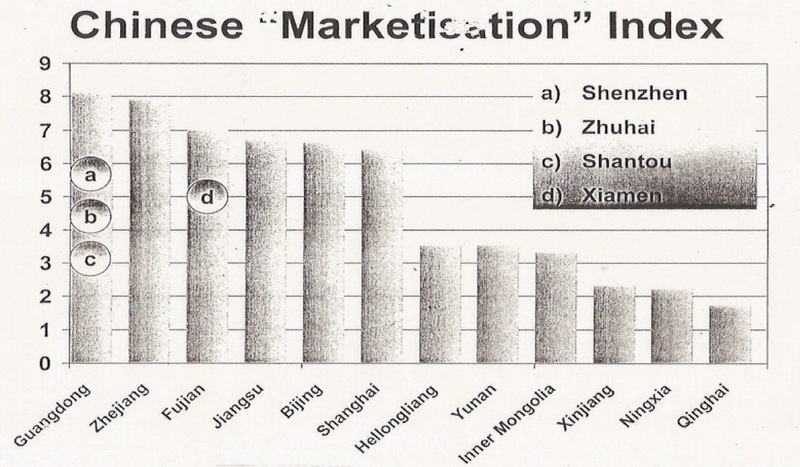 Ever since China began to liberalize its economy in the late 1970s, economic growth has been very impressive. I don’t necessarily believe the statistics coming from the Chinese government, but it’s unquestionably true that there’s been spectacular progress. The great mystery, though, is whether China will continue to enjoy rapid growth. In other words, will it actually converge with the United States (right now per-capita economic output in America is more than five times higher than it is in China)? Or will China, like many other developing/transition economies, hit a ceiling and then begin to stagnate. I don’t pretend to know the future, but I can say with great confidence that the answer depends on the actions of the Chinese government. The good news is that economic freedom jumped dramatically starting in 1980 according to Economic Freedom of the World. Thanks to good reforms, China’s score rose by more than 50 percent, climbing from 4.0 in 1980 to more than 6.0 in just a bit over two decades. That’s a huge improvement, and it largely explains why prosperity has expanded and there’s been a record reduction in the grinding poverty and material deprivation that characterized the country. But the bad news is that there hasn’t been much reform in the past 15 years. 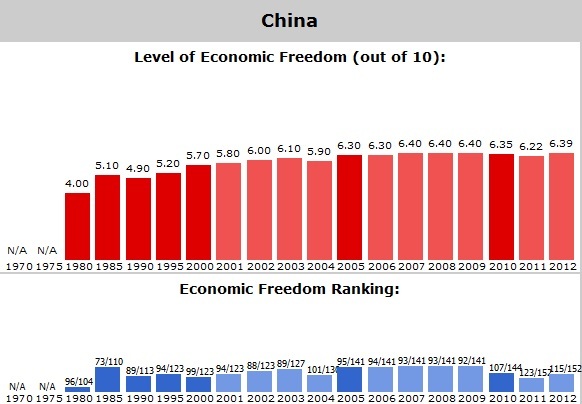 China’s economic freedom score has oscillated between 6.0 and 6.4 during that period. Indeed, there have been financial bailouts and Keynesian-style “stimulus” schemes, so it’s possible that China is now going in the wrong direction. Before digging into the details, let’s consider the economics of growth. I’ve written before that labor and capital are the two factors of production and that economic growth is a function of more labor, more capital, or learning to use existing labor and/or capital more productively. 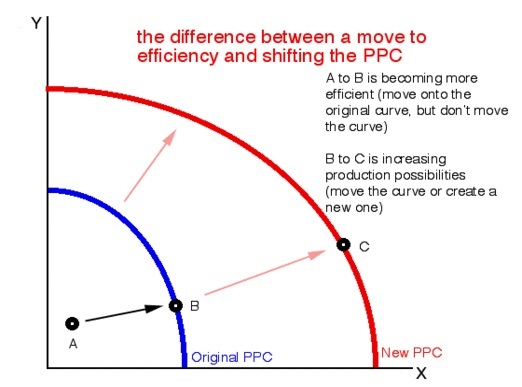 One way to visualize this is with a production possibility curve. This is a tool in economics that often is used to illustrate tradeoffs and opportunity costs. If Robinson Crusoe is on a deserted island, what the best way for him to allocate his time to maximize the amount of fish he can catch and the number of coconuts he can collect? Or, for an entire society, what’s the “guns-vs-butter” tradeoff? Here’s a chart I found online that illustrates the role of capital and labor and producing output. 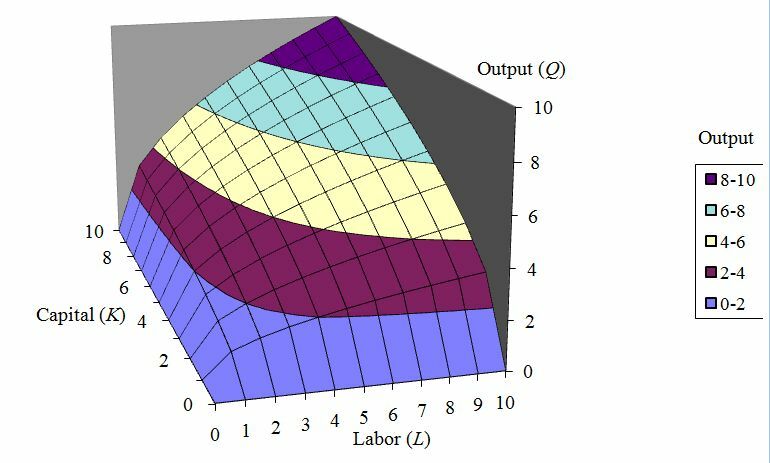 It’s a three-dimensional chart, which is helpful since it not only shows that there’s no output in the absence of capital and labor, but it also shows that an economy with just labor or just capital also won’t have much if any output. You produce a lot, by contrast, with labor and capital are mixed together. The above chart shows the amount of output that theoretically can be produced with given amounts of labor and capital. But what if there’s bad policy in a nation? Consider the difference, for example, between China’s plateaued economic freedom score and decent economic performance compared to Hong Kong’s great economic freedom score and great economic performance. With that in mind, contemplate this two-dimensional image. With bad policy, either the economy only produces A when it can produce B (i.e., by using existing labor and capital more productively) or it produces B when it can produce C (i.e., by expanding the amount of labor and capital). I suspect that China’s problem is mostly that bad policy interferes with the efficient allocation of labor and capital. In other words, there’s already a lot of labor and capital being deployed, but a significant amount is misallocated because of cronyism and other forms of intervention. Now let’s move from theory to empirical details. Here’s a close look at China’s reforms from Professor Li Yang, Vice President of the Chinese Academy of Social Sciences. Over the past 35 years, China has achieved extraordinary economic performance thanks to the market-oriented reforms and opening-up….The GDP per capita also reached to $6075 in 2012, up from $205 in 1980… China’s economy experiences impressive changes in favor of marketization. In fact, as far back as 1996, 81% of the production materials, and 93% of retail sales, had already been traded according to the market pricing mechanism. 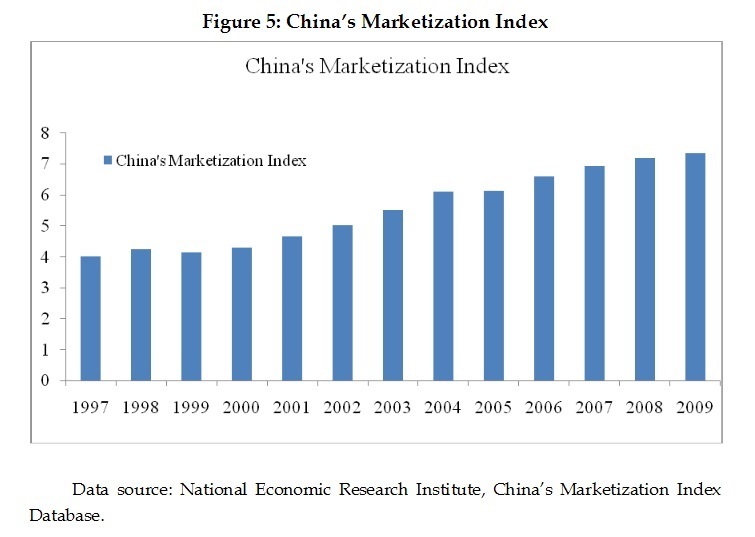 And here’s a chart showing the gradual expansion of market forces in China, presumably based on whether prices are determined by markets or by central planning. We also have two charts showing the decline in genuine socialism (i.e., government ownership of the means of production). The first chart shows that state-owned companies are becoming an ever-smaller share of the economy. 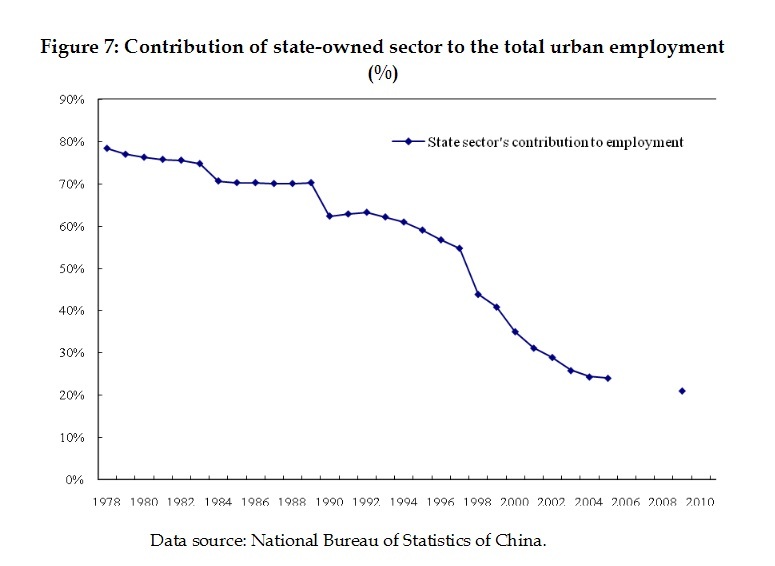 Even more impressive, there’s been a huge decline in the share of the population employed by state-owned firms. This is good news, and it helps to explain why China is much richer today than it was 30 years ago. But the great unknown is whether China will experience similar strong growth for the next 30 years. Here’s more of Professor Yang’s optimistic analysis. Another indispensable factor explaining China’s growth miracle is constant opening-up, which is equally guided by the principle of gradualism. Regarding the space structure, the markets successively opened up from the special economic zones, economic and technological development zones, coastal economic development zones, riparian regions, inland regions, and finally the whole China; regarding the industrial structure, from the advantaged manufacturing industry, to the less advantaged agriculture and service industries. In 2001, China’s entry into the WTO can be regarded as a milestone: China’s opening up transformed from selective policy measures to widespread and deep institutional arrangements. The liberalization of trade is particularly impressive, as shown by the following chart from the study. 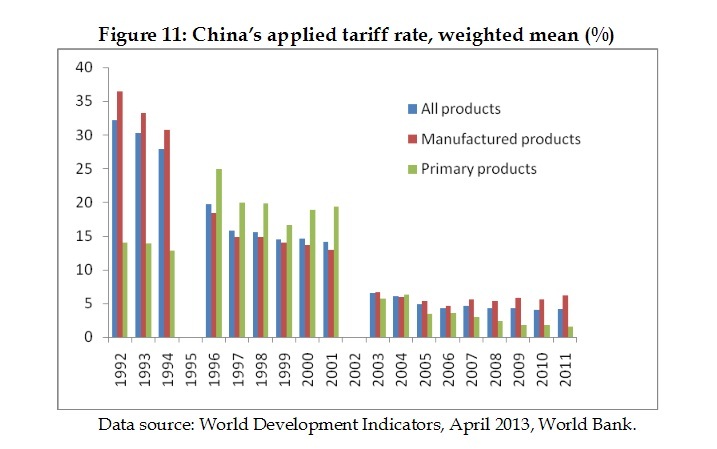 Makes me wonder what Donald Trump would adjust his protectionist China-bashing if he saw (and understood) this chart. Anyhow, here are some passages from Professor Yang’s conclusion. …market-oriented reforms constitute the most crucial factor to support China’s growth in the future. The key here is to properly deal with the relationship between government and markets. The latter will be expected to play the fundamental role in the allocation of economic resources. …China should make more effort to improve the efficiency of investment. …the government needs to reduce its intervention in the micro-level economic activities, promote deregulation and administrative decentralization, break up monopolies, and improve the efficiency of functioning. I agree, particularly the part about boosting the efficiency of investment. And that can only happen if China ends cronyism by letting capital be allocated by market forces rather than political connections. Let’s close with two items. 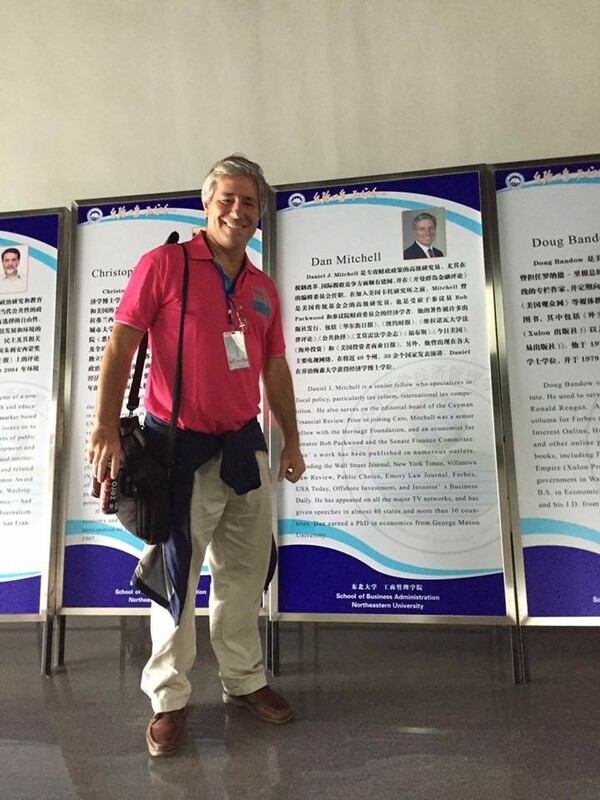 First, one of the other faculty with me at the University in Shenyang is Ken Schoolland. In his presentation, he noted that there’s some real federalism in China. Provinces have considerable flexibility to engage in reform. And it shouldn’t come as any surprise that the rapid growth in China has been concentrated in the areas that have moved the fastest and farthest in the direction of free markets. Second, some experienced observers are a bit pessimistic about future Chinese economic developments. Derek Scissors of the American Enterprise Institute explains what needs to happen to boost future prosperity. …the economy is in the process of stagnating. The only solution is a return to market-driven, politically difficult reform. Such reform must be focused primarily on rolling back the state sector. …Expanded individual or household land ownership in rural areas would be…helpful. …More individual land rights shrink the rural state. The critical step in revitalizing the economy is to shrink the urban state, and by a considerable amount. Such changes will of course be phased in over time but the sooner they start, the sooner economic performance improves. Shrinking the urban state sector would (i) finally address excess capacity; (ii) enable capital to be much more efficiently allocated; (iii) thereby slow or halt unproductive debt accumulation; and (iv)encourage innovation by enabling more competition. …In terms of capital allocation, formal interest rate liberalization was said to be a vital step. But it cannot be while the state controls most financial assets – the incentives for collusion among sister state financials are overwhelming. 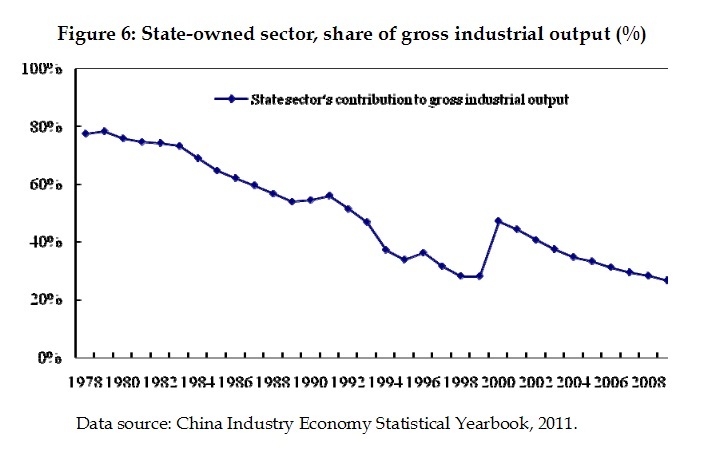 Want to know when China is going to thrive again – just check if the state sector is actually shrinking. What he’s basically describing are the policies that would dramatically improve China’s score from Economic Freedom of the World. And if China can ever climb as high as Hong Kong, then the sky’s the limit for growth and prosperity. P.S. There are some signs that China’s leadership recognizes that a Reagan-style agenda is needed. P.P.S. On the other hand, if China’s government takes the IMF’s advice, then prepare for economic decline and stagnation. P.P.P.S. The most amusing economic news in recent years was when a senior Chinese official basically explained that the welfare state in Europe makes people lazy. on August 4, 2016 at 12:37 am Kineski bijeg od komunističke gladi | Tko je John Galt? At current levels of freedom, China’s growth will stall when per capita income reaches about half the US. That will be its equilibrium point for its current level of economic freedom. One could argue whether the stall will happen at forty percent or sixty. But it’s secondary. However, remember that a China with a per capita income equal to half the United States’ will be an economy equal in size to the US and Europe combined. And then there is India and Indonesia, and three billion other souls on the planet that are growing at around six percent a year. Someone has to grow fast, very fast, if world average growth trendline remains at three-four percent when the US and Europe, the world’s two largest economies, are growing at a mere two and one percent respectively. The world where even just China has reached fifty percent of US per capita income will look and feel very different to western world voter lemmings. But as I mentioned yesterday, reaching half the prosperity level of the developed world, parity, etc are nothing more than arithmetic milestones. The relative decline of the west — a mathematically inevitable consequence of growth that is half or less the world average — brings continuous malaise as it unfolds. Avoiding the fate of decline would require an electorate willing to vote for someone who will set the country on a four percent annual growth trendline — thus matching the world average. Do you see such a candidate? No, of corse not. The electorate does not want him/her. At best the electorate will be attracted to someone who sells the idea that engaging in European style dirigisme and redistribution and/or bringing back middle-income country level jobs is the ticket to prosperity. That is a bankrupt electorate that has run out of social capital. It’s the electorate, stupid! You are on trajectory to converge into the middle-income countries of this world by the latter half of this century. And it’s not a pretty ride, is it? The time to avoid that fate was when things were going well and people became complacent. The time when we said: “We’re a rich country! We certainly can afford some more dirigisme and redistribution, so that our middle class can rise from the world’s top 4% to the world’s top 3%”. American luck and serendipity have finally run out. So what is left is the notorious American naïveté. A naïveté that is too weak to resist the inebriating corrosiveness of European dirigisme and redistribution. A naïveté destined to follow the Europeans into the middle income country club of this world — in a few decades! The question is, has the growth been primarily driven by free market activities or central planning? It is always possible for central planners and public works to mimic, for a time, a vibrant economy, especially when starting from an undeveloped one. But it is unsustainable and never lasts and, worse, the central planners almost never voluntarily give up control. Moreover they almost always suppress the rule of law which secures property and suppress property rights themselves when the unsustainability begins to inevitably show as it increasingly appears is happening now. History is absolutely littered with fireworks that fall back to earth under the weight of bureaucracy and state power. Those that stay aloft are notably sparse. Seems less than likely to me that a still functioning and powerful communist party is going to launch one of the latter.